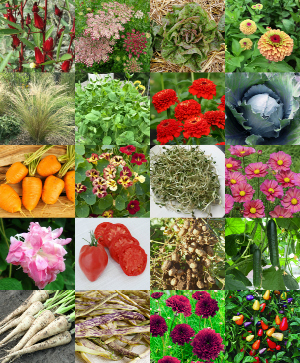 Welcome to our best-ever collection of the world's finest vegetable, herb and flower seeds. We've added so many wonderful new varieties this year. For the flower garden, you'll love the new Bloody Mary Nasturtium Mixture that flaunts blooms in cream to deep red and every streak and blotch in between. After your excitement over the new Queen Red Lime Zinnia last year, we decided to offer the entire Queen Lime Zinnia Series, as well as two more Zinderella Zinnias: Red and White.You'll swoon over the peachy-rose blooms of Xsenia Cosmos and the cabernet hues of Dara Queen Anne's Lace, and you'll marvel over the flaxen tresses of Mexican Feather Grass and the puffball blooms of Split Second Morning Glory. In the vegetable garden, why not try growing Roselles for Hibiscus tea? Have fun growing your own Peanuts, even in northern gardens, and add some pizzazz to your veggie patch with Chinese 5-Color Hot Chile Peppers and Speckles Looseleaf Lettuce. We've fallen in love with the new Lisboa parthenocarpic slicing Cucumber~it went wild in our test garden last year. Got rocky soil? It won't phase Oxheart Carrots. There are so many more new goodies to grow this year! The spirit with which gardeners sow seeds, tend gardens and celebrate seasonal abundance is extraordinary. It's contagious goodness borne of one's passion for gardening and cooking, and the magic of seeds. Growing and cooking our own food propels the cadence of our lives, our physical health and well-being, and the joy that we share in the world that we help to create. Our ever-expanding website includes photos of our homegrown harvest, extensive horticultural information, our eCookbook and Like-Minded Spirit resource sharing. Like us on Facebook to join our community. Call us for personal assistance Monday through Friday from 9:00 a.m. through 5:00 p.m. Lance Frazon, our seed specialist, loves to talk seeds. We work hard to provide you with the best, most practical horticultural information to help make gardening joyful, abundantly productive and rewarding. You will find horticultural tips for each type of vegetable, herb and flower seed organized by classification. We've also dedicated ourselves to providing you with a wealth of personally crafted recipes as well as those from renown chefs across the country. You may find our online cookbook here, or under each classification of vegetable, herb or flower. We've included a sprinkling of hands-on tips and recipes courtesy of Barbara Damrosch, Four Season Farm, Harborside, Maine. Barbara authored The Garden Primer and, together with her husband Eliot Coleman, The Four Season Farm Gardener's Cookbook. As you invest yourself in your family's kitchen garden, we encourage you to support local farmers' markets as well as organizations dedicated to community gardening and healthy food for all, some of which are included below.